The Minneapolis Star Tribune Newspaper has selected an All-Metro first, second, and third players team of the year since the awards inception in 1995 with Jamie DeGriselles winning the inaugural honors from Apple Valley. This award is not to be confused with the sponsored Ms. Hockey Award that is seperate, but ironically - a lot of the All-Metro Star Tribune players of the year have gone onto capture the coveted Ms. Hockey award, that started a year later in 1996. 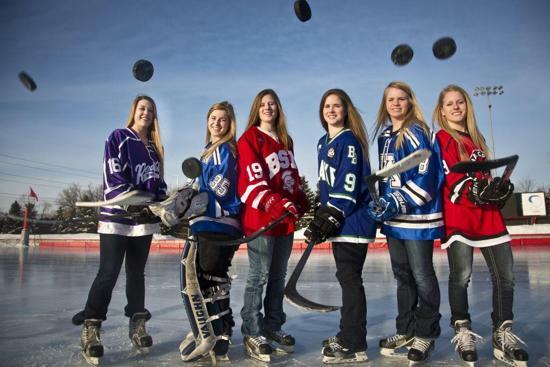 The All-Metro team and Metro Player of the year is chosen yearly before the State Tournament, whereas the Ms. Hockey banquet and award presentation is following the State Tournament. The Star Tribune Girls All-Metro award winner is based on nominations from metro-area coaches, Wisconsin and Minnesota Division I & II Coaches, and conversations with a panel of various coaches and Star Tribune high school writers obversations.